Eggnog is the ambassador drink of Christmas. Do you drink it at any other time of the year? If you do, then ... keep it to yourself cause we're talking Christmas now. With eggnog being only for Christmas I set out to find a recipe that would incorporate eggnog into the ingredients. 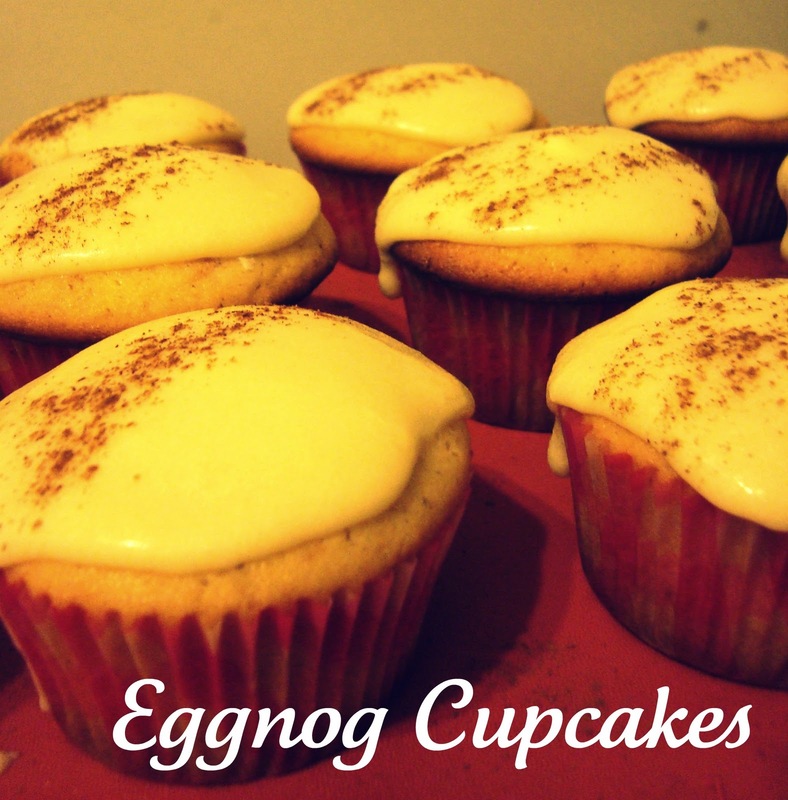 I found a really easy recipe for eggnog cupcakes. 2. In a medium bowl combine 1/2 cup butter and 1 cup sugar and beat on medium speed for about 3 minutes or until well combined and fluffy. 3. Add 2 eggs one at a time, mixing thoroughly after each one. Add in 1/2 tsp vanilla and mix well. 4. In another bowl combine 1 1/2 cup flour, 1/2 tsp baking powder, 1/2 tsp baking soda, 1/4 tsp salt, 1/2 tsp nutmeg, and 1/2 tsp cinnamon. 6. Mix until just combined then add the remainder of the flour mixture and the remainder of the eggnog and rum. Mix until combined, scraping the sides if necessary. 7. Pour batter into 12 lined cupcake tins and bake for 18-20 minutes or until the cupcakes spring back when pressed. 8. Remove the cupcakes from the pan and allow to cool completely on a wire wrack before frosting. 1. Beat 1/2 cup butter until soft, add in 2 cups confectioners sugar one cup at a time. 2. 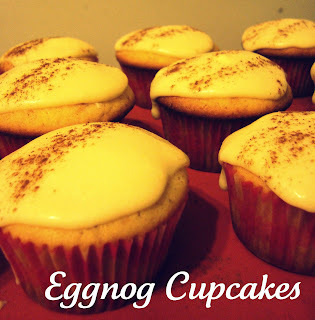 When frosting starts to become stiff, slowly add in enough eggnog (about 1/8 cup) to bring about a spreadable consistency. 3. Pipe or spread the icing on to the cupcakes, sprinkle with cinnamon and place a cinnamon stick in the cupcake for garnish. Were they tasty Jamie? I kind of REALLY want to make these! I didn't try one (torture) what with the new healthy eating thing but John took them to work and he said they got good reviews!